In ActiveMQ it is possible to define logical groups of message brokers in order to obtain more resiliency or throughput. Creating broker groups and a network of brokers can be done in various manners in JBoss Fuse Fabric. Here we are going to use the Fabric CLI. Assuming we start with a clean Fuse installation the first step is creating a Fabric. This step can be skipped if a fabric is already available. Next we are going to create two sets of child containers which are going to host our brokers. Note, the child containers we are going to create in this step are empty child containers and do not yet contain AMQ brokers. We are going to provision these containers with AMQ brokers in step 3. In this step we are going to create the broker profiles in fabric and assign them to the containers we created in the previous step. The fabric:mq-create command creates a broker profile in Fuse Fabric. The –group flag assigns a group to the brokers in the profile. The networks flag creates the required network connection needed for a network of brokers. In the assign-container flag we assign this newly created broker profile to one or more containers. A sample project containing two clients, one producer and one consumer is available on github. Even though Hawtio is a pretty awesome console for JBoss Fuse, sometimes you want or even need to have the underlying data Hawtio uses. Maybe you want to incorporate it in your existing dashboard, maybe you want to store it in a database so you have a historical record, or maybe you’re just curious and want to experiment with it. The nice thing of JBoss Fuse and really the underlying community products, mainly Apache Camel and Apache ActiveMQ, is that they expose a lot of metrics and statistics via JMX. Now you could start your favorite IDE or text editor and write a slab of Java code to query the JMX metrics from Apache Camel and Apache ActiveMQ, like some sort of maniac. Or you could leverage the out of the box Jolokia features, like the people from Hawtio did, and really any sane person would do. For those of you who never heard of Jolokia, in a nutshell its basically JMX over http/json. Which makes doing JMX almost fun again. Now to start things off here are a couple Jolokia requests (and responses) to start you off. These are just plain http requests, do note they use basic authentication to authenticate against the JBoss Fuse server. Now there are probably tens or hundreds more queries to think of, but hopefully this will start you off in the right direction. When playing around with a new Fuse 6.2.1 environment I notices the maven archetypes provided with Fuse did not run out of the box with the mvn camel:run command. When implementing a Camel context and deploying it as an OSGi bundle (for example when using JBoss Fuse or Apache Servicemix) no custom bundleactivator is used. In this post I will explain how to create a custom BundleActivator and add to the manifest of the OSGi bundle. As the quote from above states we need to implement the BundleActivator interface. We create a new Java class implementing this interface. To demonstrate the BundleActivator some simple logging is added so we have something to look at. To add the custom BundleActivator class add the Bundle-Activator option to the configuration instructions and point to the class. The OSGi bundle with a custom BundleActivator requires no special treatment regarding deployment. (kinda depends on what you put in the BundleActivator class of cource but generally speaking no special action is required). 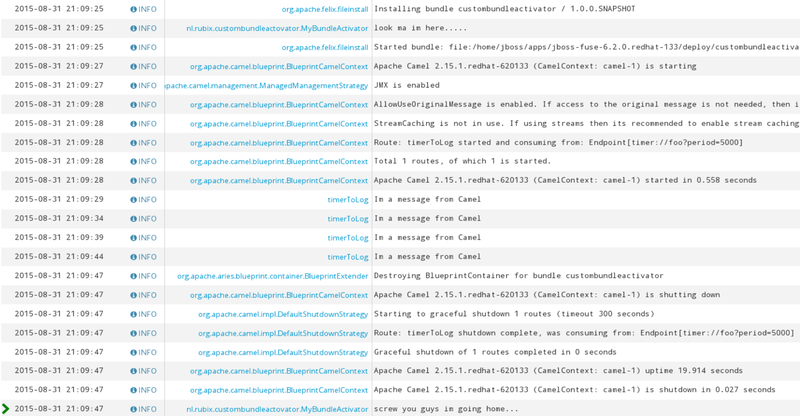 Just deploy the bundle like you would deploy any other. In this example the OSGi bundle also contains the a Camel context with one timer base route which logs a message to the fuse.log every five seconds. Tech preview in 6.1 the http gateway for Fuse fabric is in full support in JBoss Fuse 6.2. 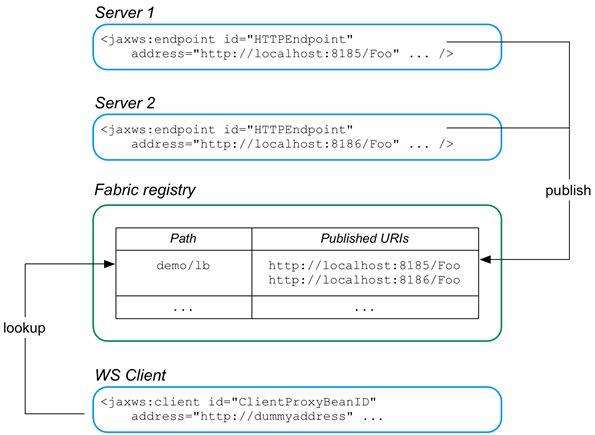 The http gateway (and mq gateway for ActiveMQ) offers a gateway for clients not residing inside the fabric to services within the fabric. When not using this kind of functionality services have to be running on particular IP addresses and ports for clients to connect to them. Even when using a loadbalancer, the loadbalancer has to know on what IP and port combination the services are running. The whole concept of fabric and containers in general is that they become IP agnostic, it does not really matter where and how many services/containers are running as long as they can handle the load. This IP agnosticism introduces complexity for clients who need to connect to these services. The http gateway offers a solution for this complexity by using autodiscovery based on the Zookeeper registry of Fuse fabric and exposes itself for external clients on one static port. So now only the http gateway needs to be deployed on a static IP and port, while the services can be deployed on any container inside the fabric. Now that the http gateway is in full support let’s take a look at it. After the container is started it provides a Rest service with four verbs, for the purpose demoing the http gateway we will be using only the get operation since it is the simplest to invoke. In Hawtio when navigating to Services -> APIs we can see the API provided by the REST quickstart is registered inside Fuse. We can browse the endpoint or retrieve the WADL. When invoking the get operation from a browser we can fetch a response. Deploying the standard out of the box http gateway couldn’t be simpler. Just spin up a new container and add the Gateway/http profile to it. But what happens when we create another instance of our rest quickstart service by creating another container with the same profile. Or replicating our container. This means clients wanting to invoke this service can use the gateway endpoint, in this example invoke the 9000 port and requests get automatically redirected to the service containers. Dynamically reallocating the services to new IP addresses and/or ports does not effect this as long as the service is inside the fabric and the endpoint is registered inside Zookeeper! Until now we have been running the http gateway in the standard configuration. This means the rules for redirecting are taking the contextpath of the service. That’s why we only had to change the port number to direct our browser to the gateway rather than one of the service directly. It is however possible to change the configuration of the gateway profile and have different mapping rules. To change the configuration of the http gateway we have to modify the properties stored in the gateway/http profile. Make sure you modify the properties in the profile and not in the child container running the profile since this can cause synchronization problems inside the fabric. When changing properties always do it in the profile/configuration registry. This can be done by utilizing the GIT api of the Fabric configuration registry directly or by using Hawtio. For this demo we are going to use Hawtio. Our rest quickstart falls under the mapping-apis category so we will have to modify the “io.fabric8.gateway.http.mapping-apis.properties” file. This can be done straight from Hawtio. Simply click that particular property file and the read-only mode opens. Here we see the path in the Zookeeper registry where the endpoints of all APIs are located. To edit the file simply click edit. As mentioned before the default mapping rule maps the zookeeperPath to the contextpath. But we can insert our own paths. # Copyright 2005-2014 Red Hat, Inc.
Now when we go to this url: http://localhost:9000/mycoolpath/cxf/crm/customerservice/customers/123/ we get the response from the service. In the example above we just changed the uriTemplate property. For more finegrained URL rules we can add extra rules also modifying the zooKeeperPath property. For example to split REST and SOAP APIs. The http gateway is a very handy tool to solve the problem of having to know what service is running on what container binding to what port. Since it uses the Zookeeper registry of the fabric it can enable making the services container agnostic. It should also help tremendously when securing the fabric. The gateway can drastically reduce the amount of ports that need to be opened for the outside world and can make configuring external proxies and load balancers a lot easier. I spent quite a few hours trying to figure out why it wasn’t loading the Keystore. Was the path and the filename correct? Where the file system access rights setup accordingly? Was there some bundle cache that needed to be flushed? of key and certificate material from a desired location. mutually exclusive, though this assumption is not encoded in schema. 1) "file", 2) "resource", and 3) "url". This attribute specifies the type of the keystore. This attribute specifes the integrity password for the keystore. This is not the password that unlock keys within the keystore. This attribute specifies the keystore implementation provider. Most common examples are "SUN". This attribute specifies the URL location of the keystore. "url", "file", or "resource" is allowed. This attribute specifies the File location of the keystore. This attribute specifies the Resource location of the keystore. This element should be a properly accessible on the classpath. When modifying the recource to file the keystore was loaded perfectly. Anyway, I hope it saves someone the hasle. In part 1 we explored the possibility to use Fabric as a load balancer for multiple CXF http endpoints and had a more detailed look at how to implement the Fabric load balancing feature on a CXFRS service. In this part we will look into the client side of the load balancer feature. In order to leverage the Fabric load balancer from a client side clients have to be “inside the Fabric” meaning they will need access to the Zookeeper registry. When we again take a look at a diagram explaining the load balancer feature we can see clients will need to perform a lookup in the Zookeeper registry to obtain the actual endpoints of the http service. As of this moment in JBoss Fuse 6.1 the fabric-http-gateway profile is not fully supported yet. So in this post we will explore the Camel proxy route. The Fabric load balancer will be implemented on the cxfrs:bean in the Camel route. Note the Camel route also exposes a CXFRS endpoint in the <from endpoint therefore a regular CXFRS service class and endpoint will have to be created. The next step is to add the load balancer features to the Blueprint.xml (or Spring if you prefer Spring). These steps are similar to the configuration of the Fabric Load balancer on the Server side discussed in part 1. So first add the cxf-core namespace to the Blueprint.xml. It is important to note the value in the “fabricPath” property must contain the exact same value of the fabricPath of the service the client will invoke. This fabricPath points to the location in the Fabric Zookeeper registry where the endpoints are stored. It is the coupling between the client and service. The response comes from the service created in part 1, but now it is accessible by our proxy endpoint. Abstracting endpoints like this makes sense in larger Fabric environments when leveraging multiple machines hosting the Fabric containers. Clients no longer need to know the IP and port of the services they call. So scaling and migrating the services to other machines becomes much easier. For instance adding another instance of a CXFRS service on a container running on another machine, or even in the cloud no longer requires the endpoints of the clients to be updated. The CuratorFramework service is for communicating with the Apache Zookeeper registry used by Fabric.